Breadcrumbs are a classic way to stretch ground meat to make it more budget-friendly, but this trick takes it a step beyond. Gelatin absorbs the milk and binds the meatballs, making them moist and tender. The meatball mixture is neutral enough that you can use these meatballs for everything from a Chinese meatball soup to a Banh Mi sandwich to a topping for pizza. Preheat the oven to 400ºF. Lightly oil a large sheet pan. In a large bowl, combine breadcrumbs and milk and mix well, then sprinkle gelatin over the surface. Let stand for five minutes to hydrate the gelatin, then add egg, onion and salt. Mix well, then add ground beef and mix with your hands. Form small, 1-inch balls (36 meatballs) of the meat mixture and place them, not touching, on the sheet pan. Bake for 15 minutes, until cooked through. Cool on a rack and refrigerate. 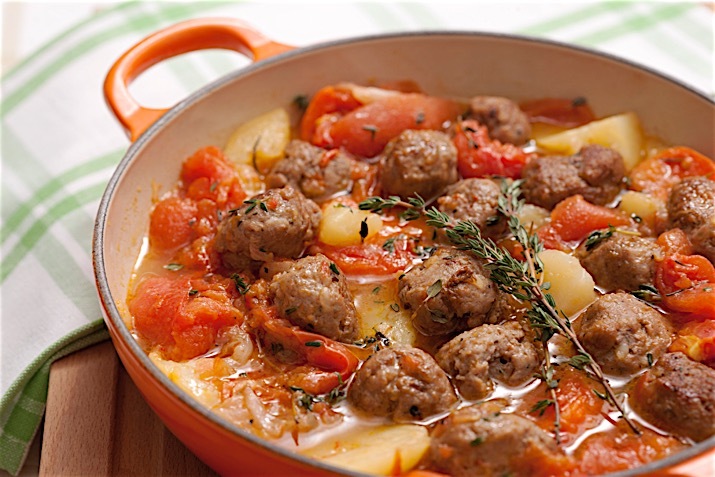 If using in other dishes during the week, meatballs can be kept in the refrigerator up to 3-4 days. If freezing, once meatballs are cold, transfer to freezer containers to freeze for about 3 months. Or, of course, use them right away in this soup! For soup, heat a large pot over medium high heat, and add olive oil. Add onion, celery, garlic and potato and sauté until softened. Add thyme and stir for five minutes. Add diced tomatoes, red wine and stock and bring to a boil. Reduce heat and simmer for 10 minutes. Season with salt and pepper. Add 24 of the 36 meatballs and simmer for 10 minutes more, then serve. Reserve the remaining meatballs and refrigerate or freeze for later use.